People love to drive and they love to gossip. With this book, the author feeds both loves. 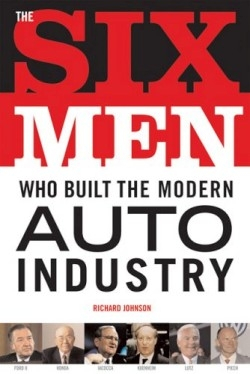 By profiling six of the men who have had the largest impact on the world automotive industry over the past half century, Johnson gives everyone who owns a car a peek into the boardrooms, design shops, and factory floors of today’s major automakers. Perhaps not surprisingly, what goes on behind closed doors is not always pretty, or even professional, and the author deliciously dives into some of the off-track behavior engaged in by these high-powered men. Of the six men profiled, three are household names: Henry Ford II, Lee Iacocca, and Soichiro Honda. Although the other three are not as well-known outside automotive circles, the author contends that Eberhard von Kuenheim, founder of the modern BMW, Ferdinand Piech, Porsche scion and builder of the Volkswagen Group, and Bob Lutz, current chairman of General Motors, have been equally influential in shaping today’s car business, the largest industry in the world. Rather than just describe the six men separately, Johnson, the managing editor of Automotive News, interestingly presents their stories in loose chronological order, allowing him to show how their careers—and often their fortunes—intersect. The story begins in the days following World War II, with Ford’s rather brutal rescue of the family business in Detroit and Honda’s quest for opportunity in Japan, and goes on to follow the rise of these men and their companies into the 1960s. In the early ’70s, the two Europeans, von Kuenheim and Piech, shook up the industry, and the family businesses, with their feats of engineering and competitive management styles. Woven within and into the present are the stories of Lutz, originally and currently of General Motors, and Iacocca, first from Ford and famously from Chrysler—outsiders who worked their way up the ladder, sometimes as cohorts, often as fierce competitors. As the men’s fortunes rise, fall, rise, and fall, an insider’s view of the auto industry emerges: the fight to win the hearts and minds of car consumers is not for the faint-hearted. Wrapping up his account, Johnson demonstrates how difficult it is for men with gigantic talents, and the egos to match, to find a place for themselves after their car years. This book will certainly resonate with automotive enthusiasts and business-school devotees. It occasionally lapses into industry-speak, such as assuming that readers know why a CVCC engine was such a breakthrough or why four-wheel-drive caused such a sensation. That is easily overlooked, however, as the book also offers something for everyone who has dreamed about, shopped for, and owned a car: a tantalizing look into how one man’s dream becomes a four-wheeled reality.